By Jake Rocheleau in Toolkit. Updated on November 6, 2018 . A frontend framework should be lightweight and easy to use. Bootstrap is the most popular, although it’s also one of the heaviest. And, in a world with many alternatives to Bootstrap, it can be tough finding one you like. Mini.css is a newer framework and it really lives up to its name. Currently in version 2.x, this framework aims to be as small as possible, currently weighing only 7KB when gzipped. The entire framework is mobile responsive and should work for any layout you need. But, the goal is to keep this library slim offering the bare-bones essentials for your work. You can install Mini.css with any package management system such as Yarn, npm, or Bower. It can also be installed directly if you download the files from GitHub. Once it’s added to your web page, you just mark up the site like normal and you’ll notice effects immediately. Type, buttons, links, forms, tables, all of these default elements come with base styles in the Mini.css library. To set up a responsive layout, you’ll need to use the grid system which isn’t too hard to pick up. All of the documentation is written in plain English, so it’s easy to understand. 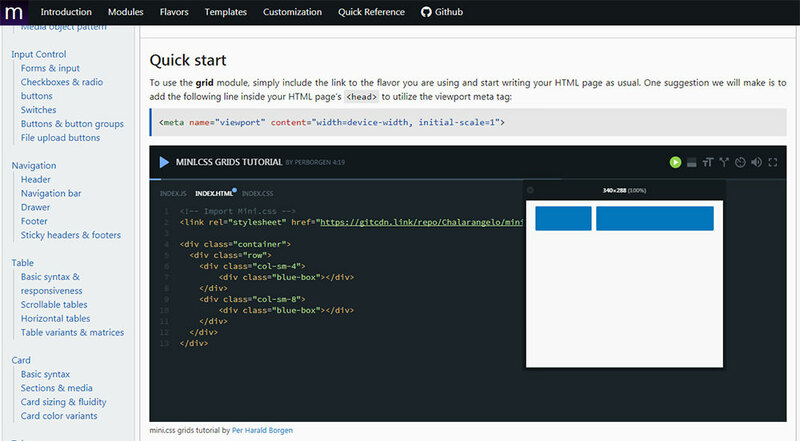 Plus, they include screencast videos from Scrimba which makes it easier to follow along with code examples. As you get deeper into this library, you can check out their guidelines for customization if you wanna add features or edit existing ones. Or, if you want to start a project quickly check out their default templates, too. These work on columned layouts and help to organize your site a lot better. I really like the Mini.css library because it’s working to create a frontend resource that’s both small and applicable to every project. Definitely worth testing on your next project if you want something lightweight and easy to pick up.